The Weinlaubenhof of the Kracher family in Illmitz, Burgenland, is the no.1 address in Austria for high-quality sweet wines . The warm-humid climate of the Neusiedlersee promotes the formation of the noble rot, whereby high class sweet wines can be produced in nearly every vintage. Today, Gerhard Kracher runs the family business and continues the work of his grandfather and father with equal care. 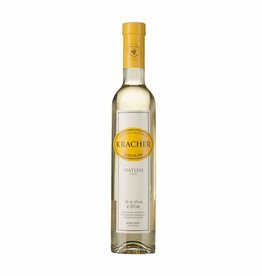 The sweet wines of the Krachers are mostly made from the white grape varieties Welschriesling, Weißburgunder, Chardonnay, Traminer, Scheurebe (Samling 88) and Muskat-Ottonel, sometimes even from the red Zweigelt. Most of the wines are aged in tanks or large wooden barrels. The "Nouvelle Vague" series is stored in barriques.